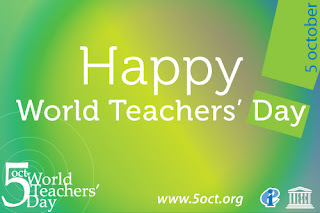 For all of the teachers I have had in my life who shared your passion with me, thank you! It's not too late to connect to the World Teachers' Day website and send an email thank you to a colleague, a former teacher, or even someone who is in college now preparing to fill the vacancies in the teaching profession around the globe. For my colleagues who believe in inspiring today's youth and developing their inquiry skills so they are not afraid to ask what, why and how, thank you! Despite the obstacles thrown (go ahead and thrown in your own obstacle here - I'll call it over testing, trying to use business models on education, lack of funding) at education, continue to be champions of discovery. Don't be afraid to be agents of change. The world needs more teacher leaders. Pass the passion on. For the parents, community members, and others, who support educators, thank you! From academics to career and technical education to fine arts to special education and more, teachers are vital to shaping the future of our world. It is through not just educational professionals standing up for what they do but others speaking up for us as well that we as educators can help prepare students for a global society that is constantly changing. 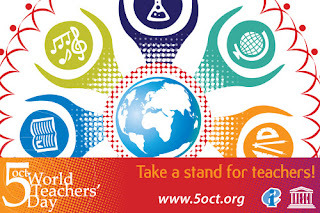 If you want to stay connected to more information about World Teachers' Day, you can follow them on Twitter at EduInt or look for #WDT2012. Dinner on the deck tonight. Day 254: Custom made iPad carrying case- Thanks mom! Fits my iPad in its otter box. Has owls for the FFA Advisor. Front zipper pocket for charger. Inside pockets for cell phone, stylus, etc.